Soothing blues and slow motion of swimming fish feeding off a perfect artificial ocean floor is a sight that calms and balances life itself. 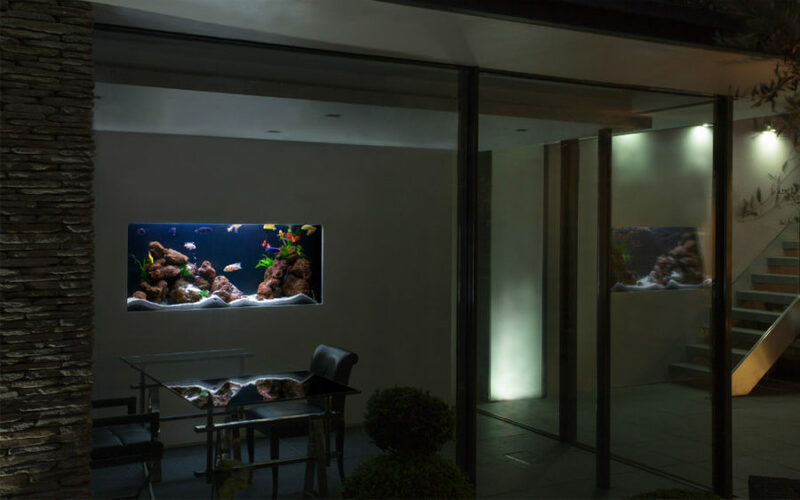 While a freestanding fish tank might add a bit of that calmness to your interior design, there is nothing quite like the built-in aquariums. Impressive and mesmerizing they offer a lot more space for bigger fish and beautiful waterscapes too. 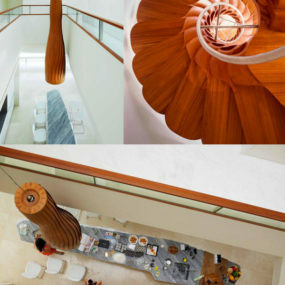 There are a lot of ways to use them in interior design for both practical purposes and pure aesthetics. Cleverly named NeMo (New Modern), this Florida residence by Phil Kean Designs features the best kitchen backsplash one could ever imagine. Held within a stone-clad structure the aquarium glows with intense blue color showing off a gorgeous waterscape. It surely isn’t as practical as tiles, but it definitely beats the latter in the aesthetics department. Also, what a way to compensate for a lack of a kitchen window. 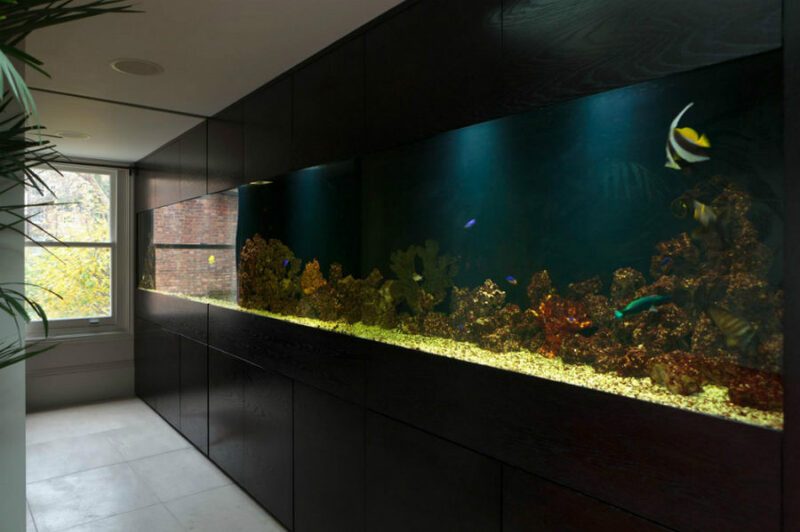 Staffan Tollgard Design Group has designed this Notting Hill Residence in London adding an impressive wall-width aquarium to a wall storage system. If there is a better way to dress up a storage wall we haven’t found it yet. 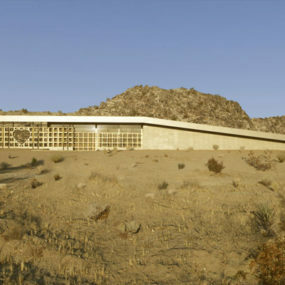 But this incredible water tank should do just fine. If you’re short on space a big aquarium might stay a dream. Although One Studio has created a concept for a tiny apartment (390 square feet/36 square meters), which might just give you an idea. 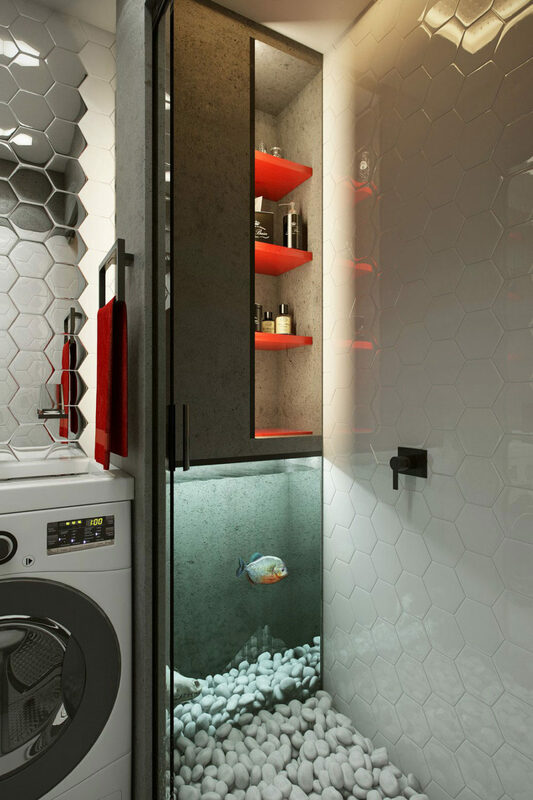 Placed in the bathroom below cabinets this aquarium concept is not only space-conscious, but also one of the most unusual we’ve seen so far. 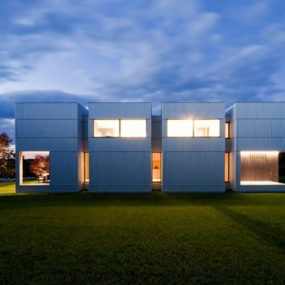 Designed by Dirk Denison Architects this Chicago home boasts not one but two aquariums. 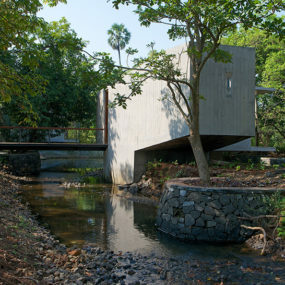 The water features are integrated into a wall, but are still protruding just a little bit. Brightening up the room with their beautiful waterscapes these aquariums look bold in a neutral color scheme. Saltwater Reef Aquarium by Okeanos Group is an incredible feature. It’s not exactly a room divider, but it has a functional storage unit below the impressive aquarium. While simpler waterscapes would probably cost less, reef aquariums are among the most picturesque things you’ll ever see. No outside views are required with a fish tank like that. 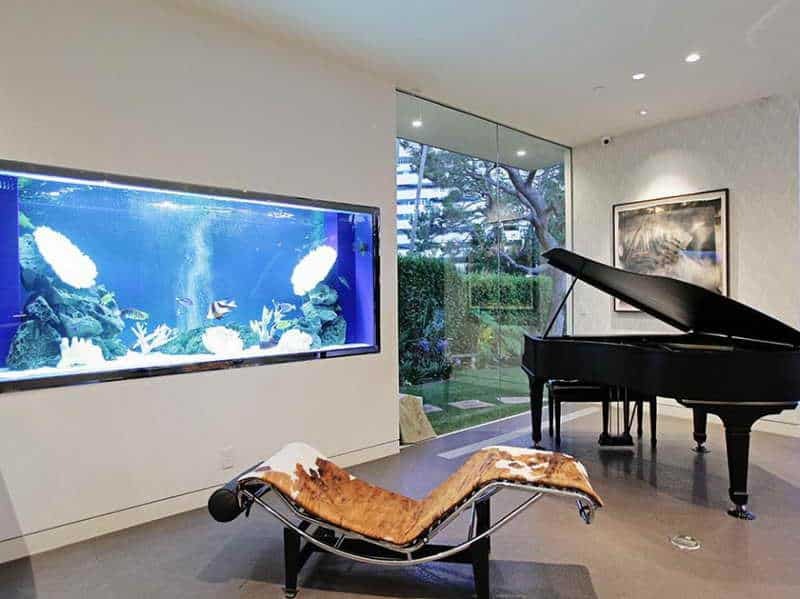 Although room dividers can be freestanding, the existing walls can benefit greatly from a built-in aquarium. 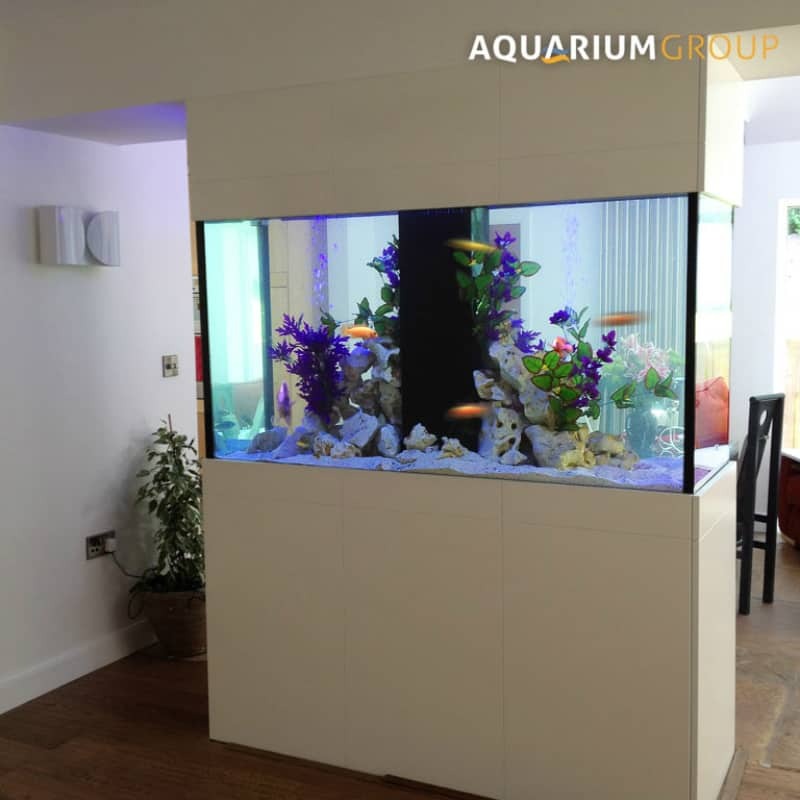 Clayton Aquariums have integrated this minimal but showy fish tank into the wall opening the room up to the rest of the layout. 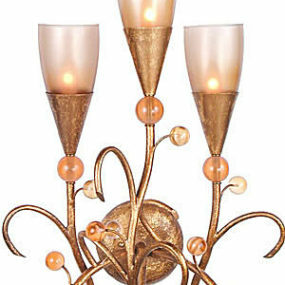 This can really help enhance your interiors further, at least visually. Not to mention bring a piece of nature inside your home. 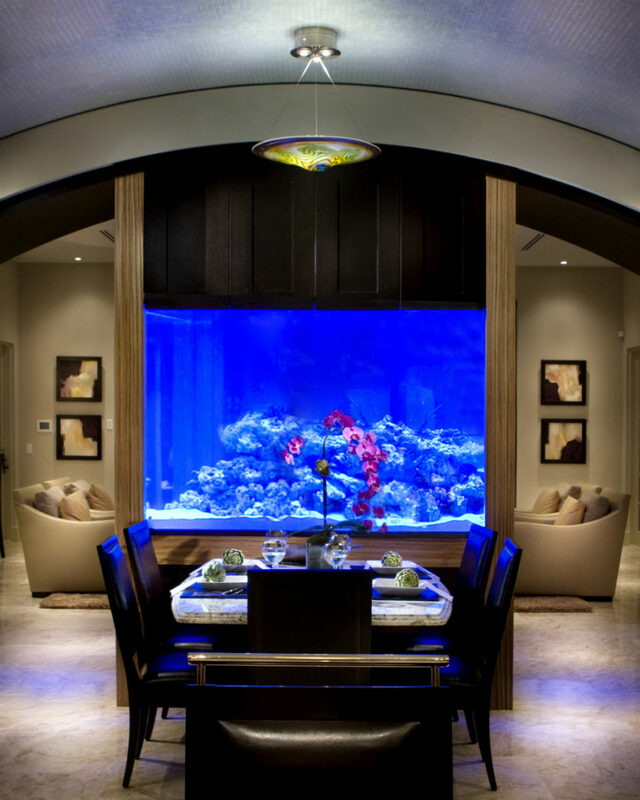 Aquarium Architecture creates amazing water features for every room from kitchen to hallway. 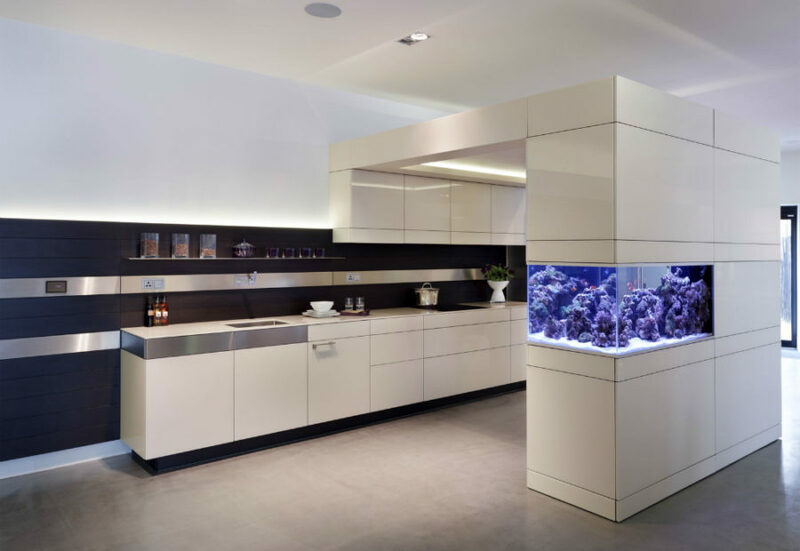 In Richmond Residence the firm added a TV-like built-in fish tank to the kitchen area to make it more lively. Aquarium room dividers isn’t a new concept, but it’s great in so many ways. 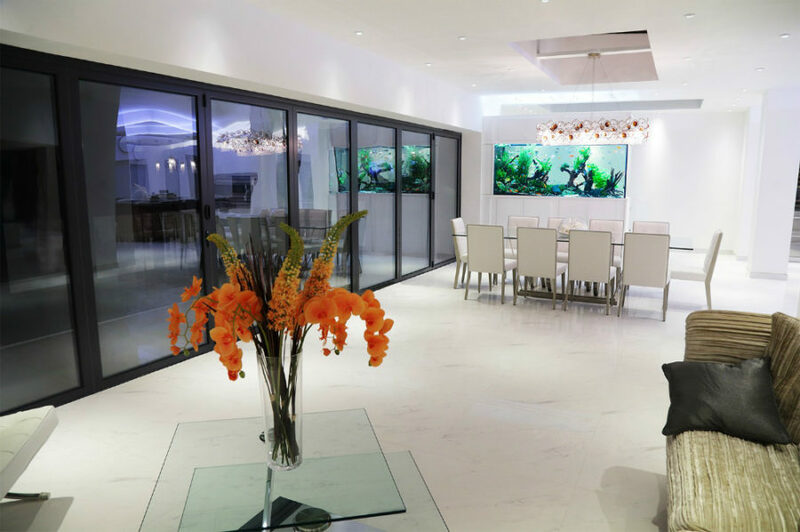 Due to its transparency the aquarium is a perfect divider for modern open plan rooms as it both adds privacy and keeps the space airy. This Connecticut home is stunning with its views of the Rockwood Lake and 13.5 acres of green land. 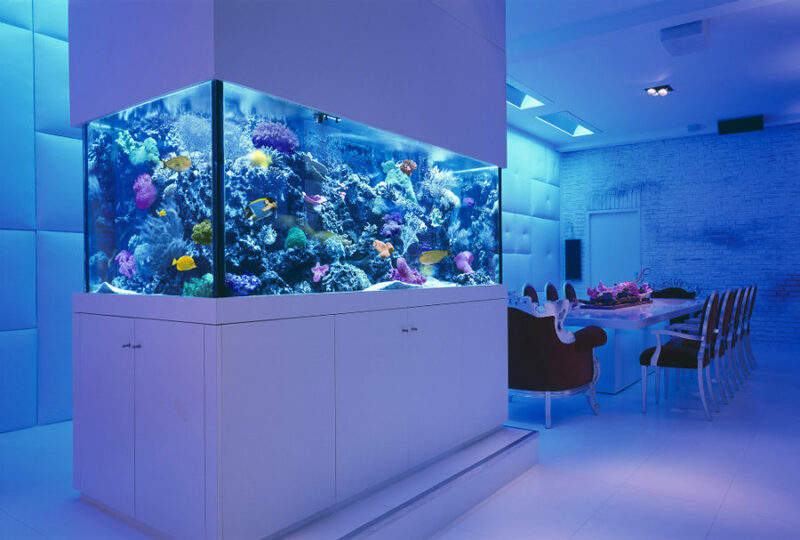 Wadia Associates though decided to amplify the luxury with a huge room-dividing aquarium. 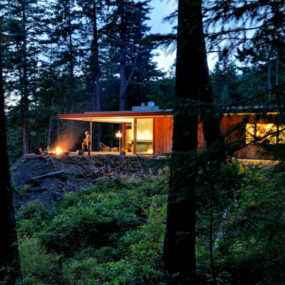 Its beauty can be appreciated from both rooms it’s separating. And the transparent walls allow the natural light travel throughout the house. This Lounge Diner Divider from Aquarium Group is a simpler but no less beautiful design. Filled with purple and green plants it adds bright accents to the modern interior. The divider itself is pretty minimal, which makes the contents stand out more. What a perfect office addition! Okeanos Group‘s Fish Only aquarium is a relatively small divider. It doesn’t go all the way up to the ceiling, but it surely separates the living room from the dining area. Its blue waterscape fits with the black and white neutral design and brings the much needed splash of color to the decor. 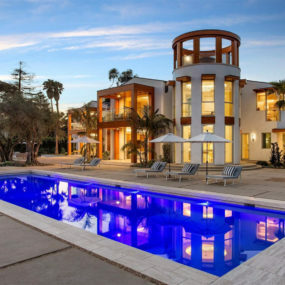 One of Jeffrey Shah‘s luxury homes has a divider aquarium that can make you feel like you’re eating under the sea or at the very least at an oceanarium. Its perfect location breaks an open layout interior into zones adding a design element to all areas. Cascina is a private Italy home designed by Persico Studio. Fronted by a pond Cascina also boasts a beautiful fish tank that livens up an open kitchen and dining room all the while zoning them out. Aquariums more often than not come in rectangular shapes, but custom-built designs can be more flexible when it comes to form. Two of the other popular shapes are a hexagon and an oval. Surely it’s not a true oval but at least it features rounded corners and looks a bit different than usual in-wall aquariums. Beside the oval shape there are hexagon fish tanks, but they usually come as separate features rather than the built-in ones. 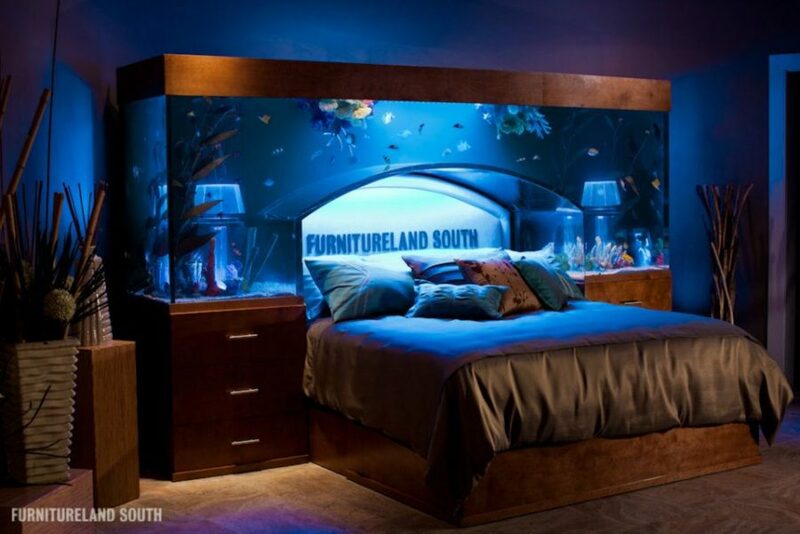 Acrylic Tank Manufacturing have created the best headboard in existence for this Furnitureland South bed. Featuring an unusual shape it can definitely make one believe he or she is one of the sea creatures snoozing on the ocean floor. Curiously enough the designers added two night lamps as part of the waterscape, but they aren’t functional, so a glowing lighting feature is used instead. 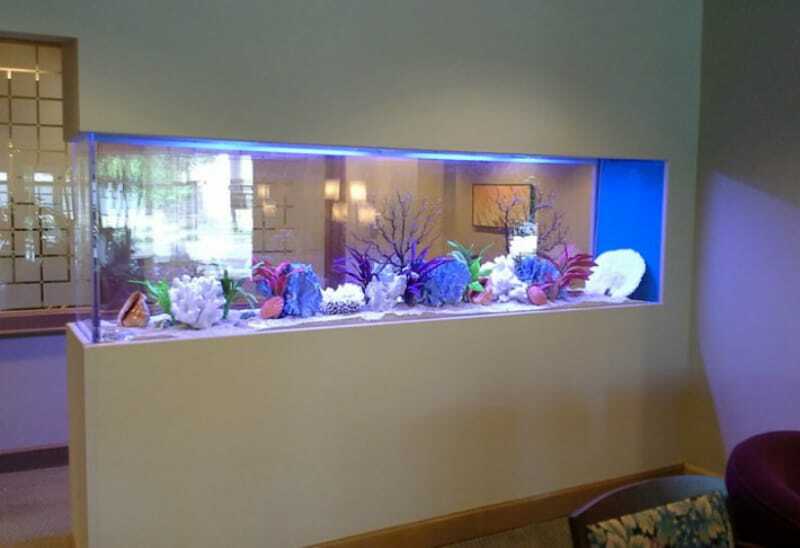 In-wall aquariums are the most popular among built-in fish tanks. They can be integrated into almost any room including kitchens and dining rooms. 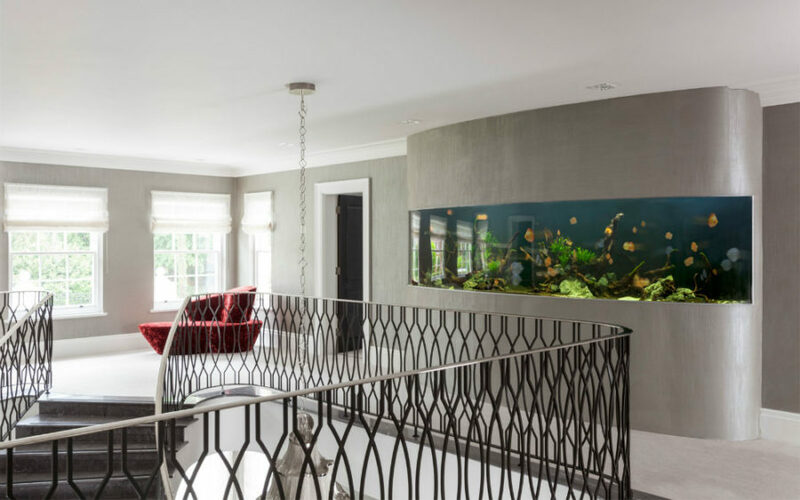 Another one of Aquarium Architecture’s projects is this incredible dining room freshwater fish tank that cuts off the area from a glass staircase. Although it works more like a room divider its wall-like structure blends with the rest of the interior. And the waterscape looks like an artwork on the wall. This Milan Residence features a lot of glass inclusions and statement pieces like a black grand piano and a cow hide-covered lounge chair. 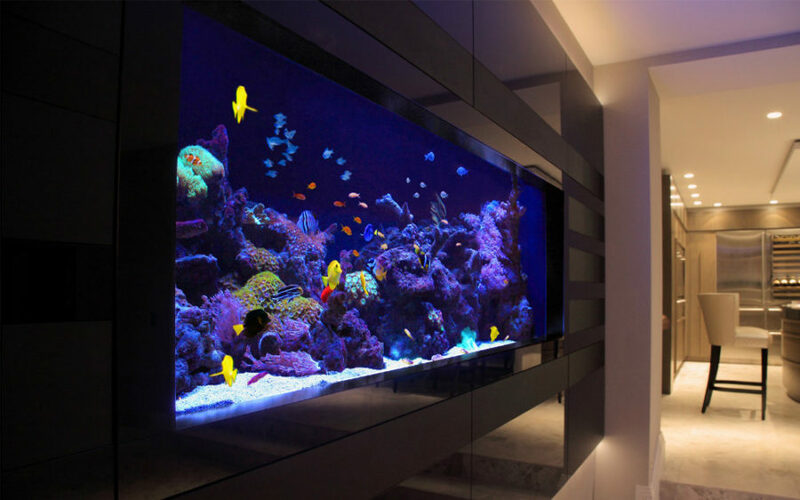 An in-wall aquarium tops off the list of impressive features adding another eye-catchy detail to the modern house. 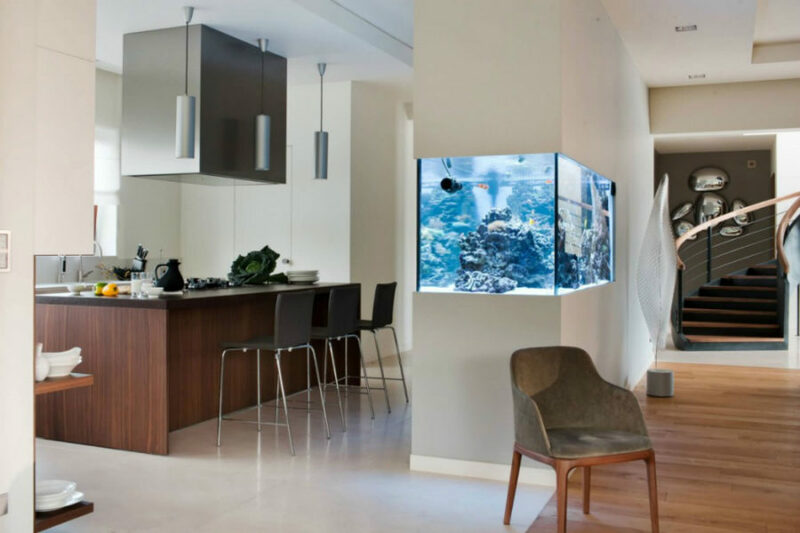 Aquarium Architecture make a case for a small dining room in-wall addition. The aquarium though small is no less impressive. Clever built-in lighting gives off a gentle glow doubling as the night light for the room. Bored with integrated wall aquariums? How about aquarium strips that stretch and extend from wall to wall? Water strips look great in any room and they don’t even have to be that big. White neutral walls are perfect for the strip aquarium design, but as you’ve seen above black may also work quite well. This water strip looks especially impressive on the neutral background. Thanks to open layout it decorates both kitchen and dining area. 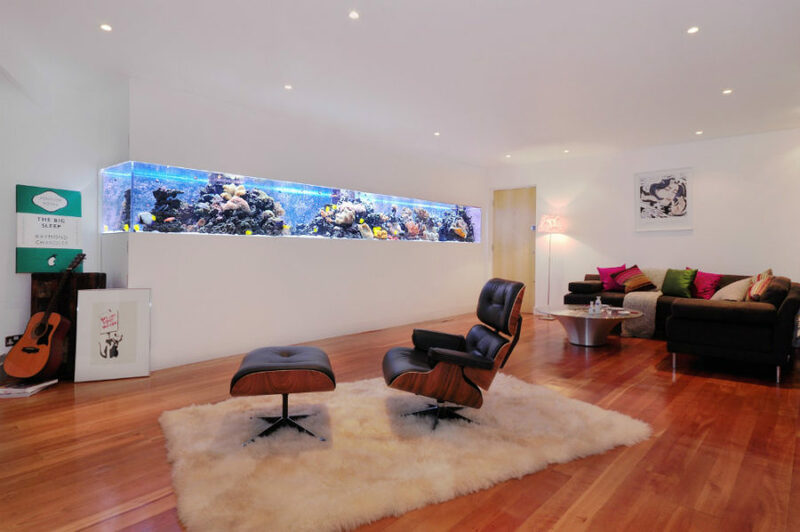 This thin Aquarium Architecture fish tank stretches from wall to wall and becomes a focal point of the room. A perfect accent for a modern minimal home. 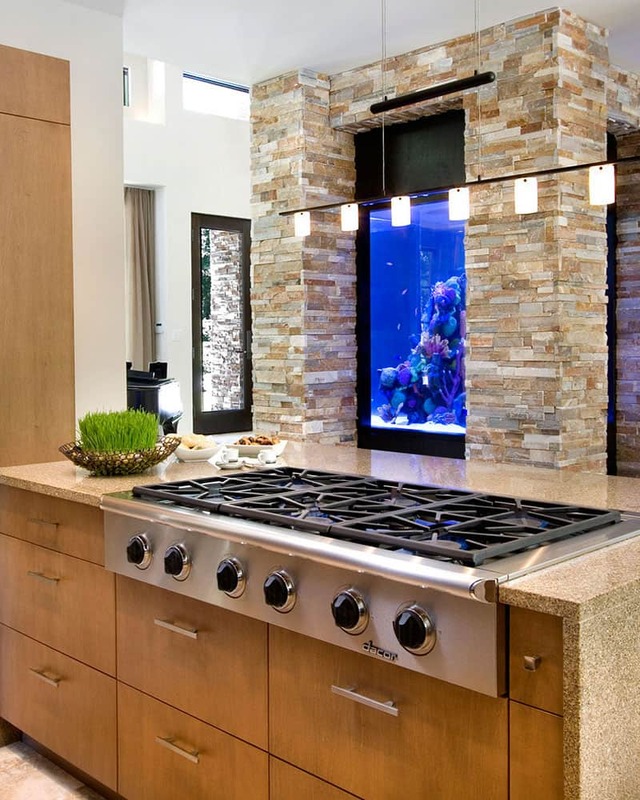 Kitchen aquariums have become some sort of a trend of late. And some designers came up with especially bold ideas and concepts. Take Robert Kolenik and his Ocean kitchen that made a lot of noise a few years back. 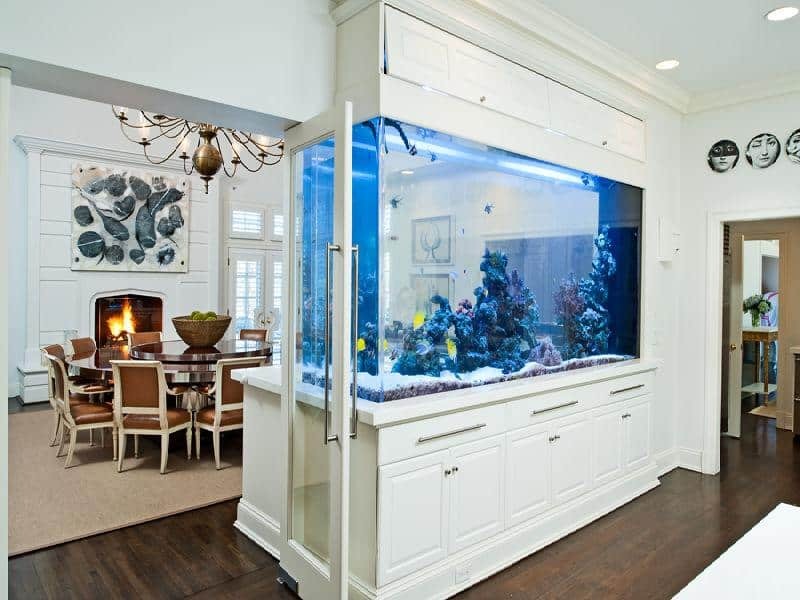 Comprised of a giant kitchen island containing a roomy aquarium the kitchen barely requires anything else in terms of decor. 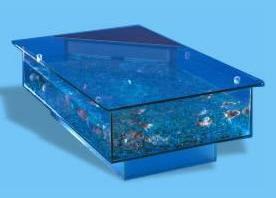 Feeding fish may seem tricky, but the countertop raises with a push of a button allowing for cleaning and feeding. 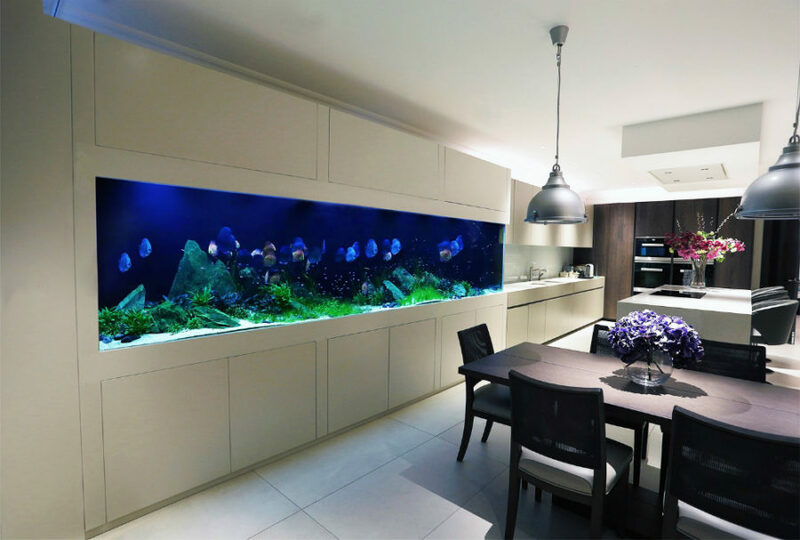 Aquafront had a great concept of a minimal kitchen with a reef fish tank built into cabinetry. Playing with contrast the designers accented the beauty of a purple reef waterscape. In the background everything seems as practical as you’d expect in the kitchen. Forestalling the floating shelf trend the kitchen features the thinnest stainless steel display shelf for tableware and spices (or maybe fish food?). This kitchen was designed by Mark Gacesa for the Central Beach House. 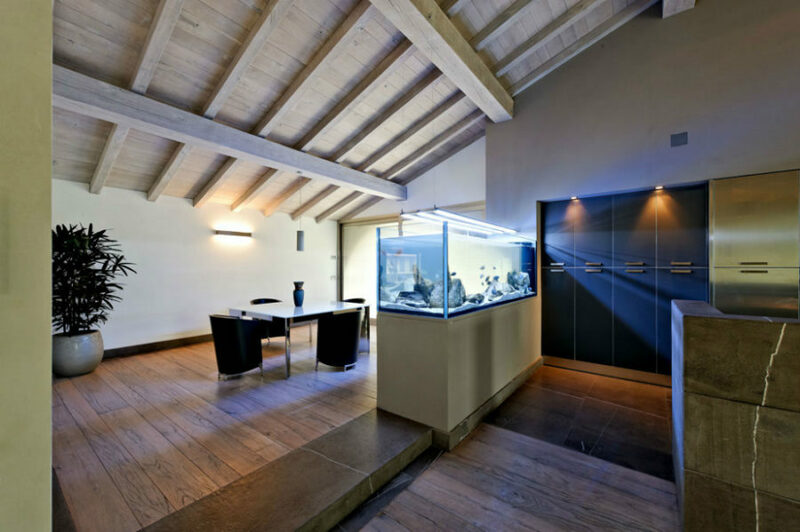 Installed into wooden cabinetry the blue aquarium stands out with a beautiful waterscape. Built-in lighting accents every element of the interior including a stone dining tabletop and a floating kitchen island. 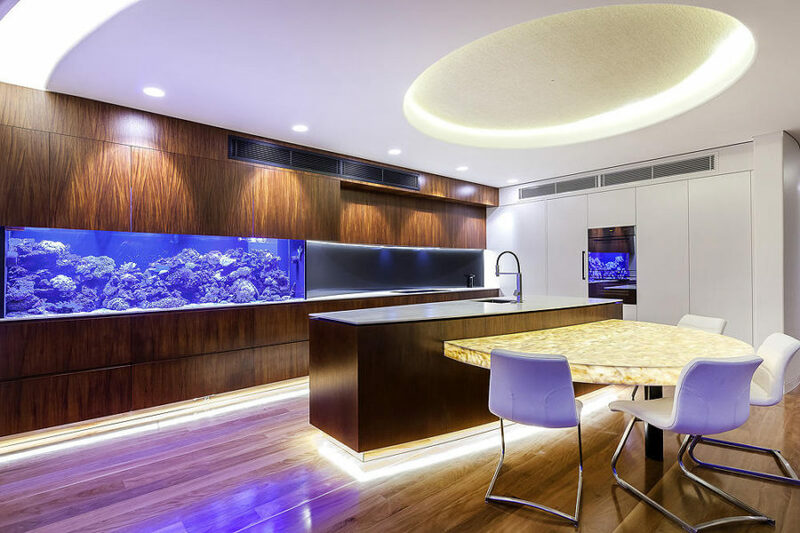 Domesticated Nature by Mood Works is a private residence with a surprise detail in the kitchen, a gorgeous reef in-wall aquarium. It contrasts greatly with the minimal kitchen design, but also plays to the chosen theme. Architectural aquariums are something else. Being an integral part of a structure these look not just impressive but simply out of this world. 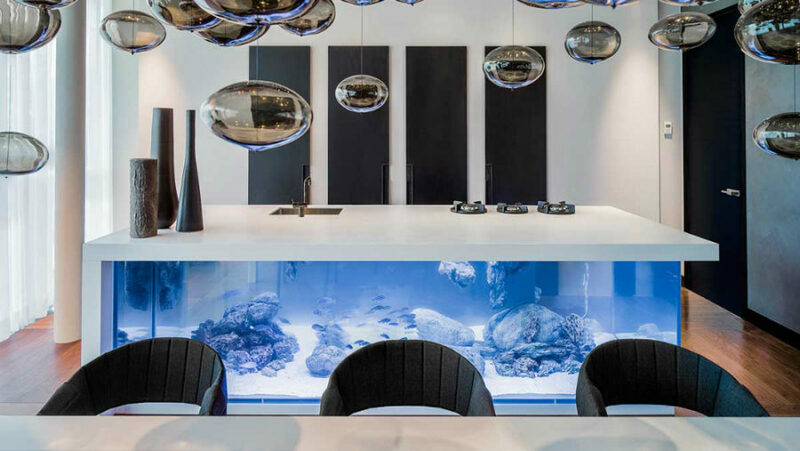 Aptly named the Villa with Aquarium was designed by Centric Design Group and is located in the Netherlands. Doubling as mezzanine railings the fish tanks make the interior design look completely unique. The glass fireplace on the ground floor echoes the aquarium, railings and keeps the place looking light, fresh and airy. 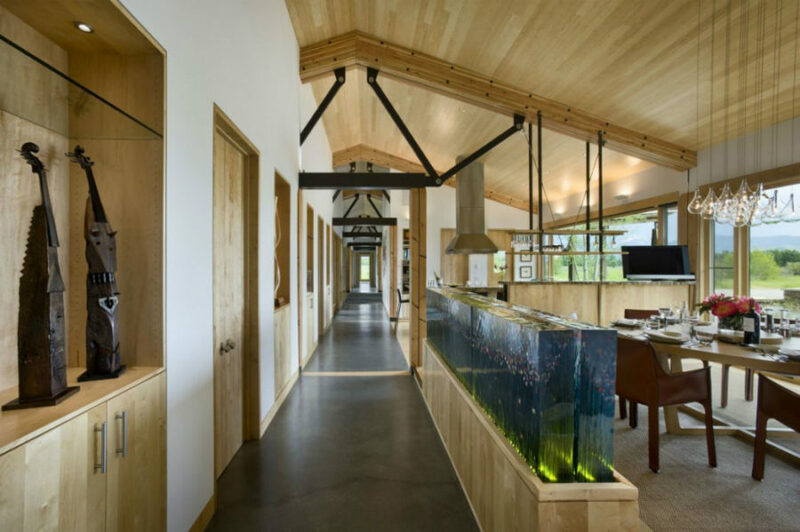 EHA Family Trust Residence in Wyoming by Ward+Blake Architects was completed with a stunning open aquarium back in 2011. The incredible feature makes a divider between an open dining room and hallway leading to the rest of the rooms. 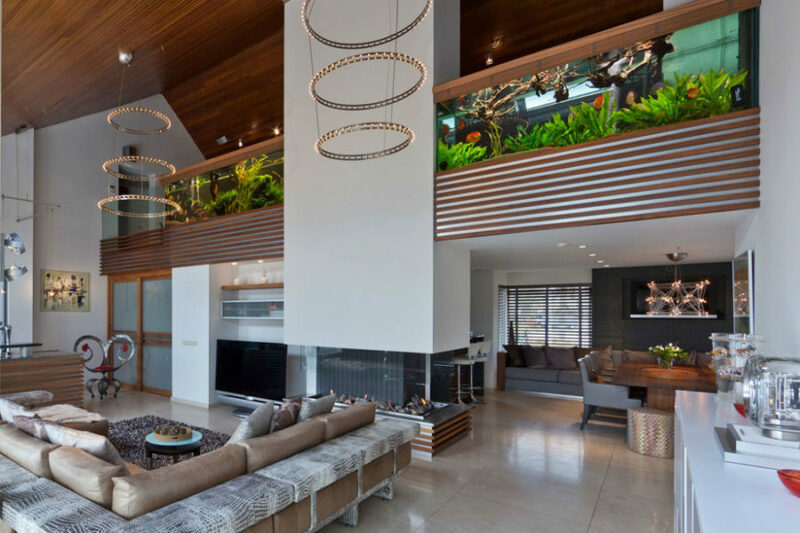 Built-in aquariums are certainly an investment. They require not only careful planning but also maintenance. But if their soothing blue glow and slight motion help you relax and rest at the end of a long day, then it’s all worth it. Luxury House – modern design by French architects will fascinate you! Gold Interior Design in a Golden Exterior House – amazing!